We provide enterprise-level IT to small and midsize businesses and take the heavy lifting off your shoulders so you can focus on what you do best. With a strong emphasis on defensive measures including multi-layered security, monitoring, audits, and best practices, we're able to predict and prevent many common issues, which translates to fewer interruptions for your business. Delivering these critical IT services, all in one offering, allows us to keep things simple, avoiding additional costs for you. 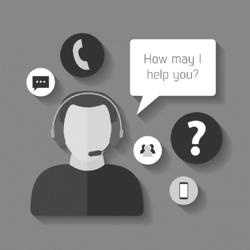 Our dedicated help desk is always available for our clients. Best practices, ongoing training, and attention to detail all help ensure we meet or exceed our service goals. Our professionally staffed help desk includes both desktop and network engineers, reachable via phone, email, or our online client portal. We use a ticketing system to track every single issue, referencing the assigned ticket number until it's resolved. Clients can access ticket statuses via our online client portal. In addition, our account and project managers work closely with each client to understand their business. Regularly scheduled strategy meetings focus on where the business is headed and how IT can play a role. Tabush provides an effective, multi-layered, focused approach as a managed service provider that works to keep our organization's operations running around the clock. Find out how we can help you focus on growing your business.